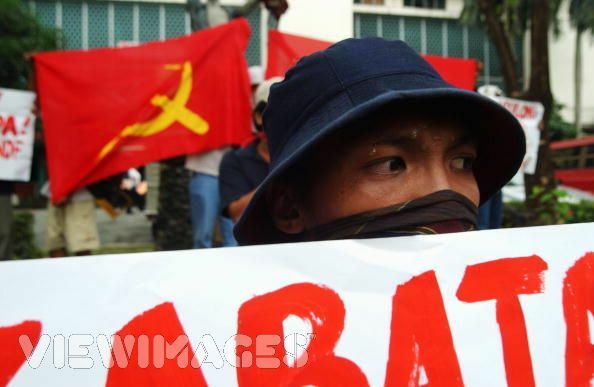 On behalf of the entire Communist Party of the Philippines, we extend the warmest comradely greetings of revolutionary solidarity to the Communist Party of Nepal (Maoist) through its Central Committee on the occasion of the international seminar on Imperialism and Proletarian Revolution in the 21st century to mark the 10th anniversary of the launching of people’s war. We admire and congratulate the CPN (Maoist) for its great victories since the launching of people’s war in 1996. Under the guidance of Marxism-Leninism-Maoism, the CPN (Maoist) has grown tremendously, built the People’s Liberation Army (PLA) into a powerful force and won the overwhelming support of the Nepalese people. Without the people’s war and the people’s army, it would not have reached the level of achievements that it has reached. The CPN (Maoist) has gained control of much of the countryside, paralysed the repressive capability of the reactionary police and security forces, formed mass organization of workers, peasants, women, youth, teachers and ethics minorities, established organs of political power in the base areas, and led the gigantic protest actions of the broad masses against the tyrannical and autocratic rule of Gyanendra. The CPN (Maoist) has entered the new phase in its struggle for democracy against the monarchy with the signing of the Comprehensive Peace Agreement with the parliament headed by Prime Minister Koirala. This is a phase of struggle that is undoubtedly fraught with dangers and challenges, requiring on the part of the CPN (Maoist) revolutionary integrity, strategic wisdom, tactical skills, courage and vigilance. We wish the CPN (Maoist) the utmost success in bringing forward the people’s revolution by upholding the leadership of the working class on the basis of the worker-peasant alliance and the broad multi-party united front and putting into practice the Marxist-Leninist theory of state and revolution in order to serve the immediate and long term interests of the people of Nepal. The international seminar serves as a meaningful occasion to celebrate the victories in people’s war achieved by the CPN (Maoist) and the Nepali proletariat and people and also to affirm the correctness of Marxism-Leninism-Maoism as the ideological guide for communist and workers’ parties in the present era of imperialism and proletarian revolution. The seminar provides the participating parties and groups with the opportunity to exchange views on imperialism and the proletarian revolutionary strategy and tactics in the current situation, and to learn from each other’s experiences in waging revolution under concrete conditions in their own countries. The CPP and the CPN (Maoist) have had so much in common for a considerable period of time. They take Marxism-Leninism-Maoism as ideological guide, view their respective societies as semi colonial and semi feudal, adhere to the general political line of new democratic revolution, and subscribe to the strategy and tactics of protracted people’s war. They continue to have much to learn from each other. It is benficial to the people of Nepal and to the people of the world for the Communist Party of Nepal (Maoist) to take full advantage of its won victories and the crisis of the world capitalist system and the Nepali ruling system and to remain steadfast and advance on the road of people’s democratic revolution by carrying out every necessary form of struggle against imperialism and the local exploiting classes of big compradors and landlords. Long live Communist Party of Nepal (Maoist)!